Remember that Fig & Bacon Jam? Me, too. I made two batches of it. We ate two batches of it. The sandwiches and pizzas and burgers were amazing. RIP Fig & Bacon Jam. You add more figs and you add more bacon. And this is what happens when you do that. 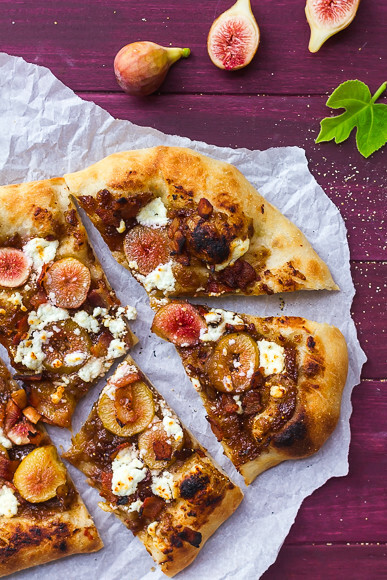 Fresh Fig and Bacon Jam meets your favorite pizza dough. And more bacon. And more fresh figs. And goat cheese because of course goat cheese. If you’ve never taken a peek at my homemade pizza tips – some of the instructions might look a little different. You can follow them or if you already know that you make the most awesome pizza in the world, do it your way. You cannot screw this up… aside from forgetting to set the timer with food under the broiler, pouring a glass of wine, and then suddenly smelling smoke. 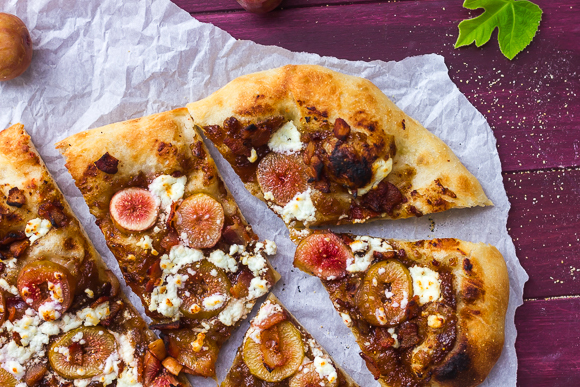 The ultimate fig and bacon pizza: fig and bacon jam, crispy bacon, sliced figs, and goat cheese. Preheat oven to 550 and adjust the top rack so that it's at the top 1/3 of the oven - and if you don't store your pizza stone in the oven like I do, this is where you put it in to heat. Divide the dough into 3 equal-ish pieces, dust with flour, and loosely cover with plastic wrap. Cook the bacon until it's just beginning to crisp and then use a slotted spoon to transfer it to a paper towel lined plate to drain. Very lightly flour your work surface: I use a pizza peel (but you can use a rimless baking sheet, or turn a rimmed baking sheet upside down and use the bottom) and then sprinkle a couple generous pinches of cornmeal over the flour. Gently stretch the dough with your hands (I use the steering wheel method) until you get it to the thickness and size you want and place it onto the prepared peel or pan. 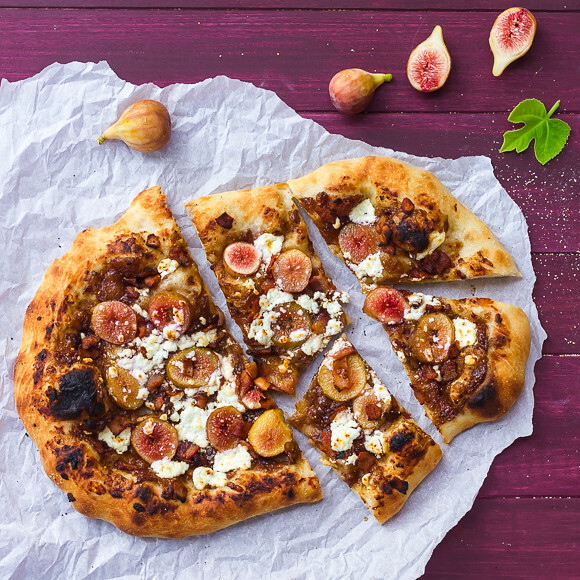 Brush the outside ~1-inch perimeter with olive oil and then spread with 1/4 cup of bacon jam, sliced figs, 1/3 of the bacon, and some crumbled goat cheese. Gently shake the pizza from the peel/pan to the baking stone and broil for 5-7 minutes while you make pizza #2. Remove the pizza from the oven, leaving the stone in place. If you're night slicing and serving immediately, transfer it to a rack - the crust can get a little soggy if you put it directly onto a peel/cutting board/plate and just let it sit there. Repeat to cook and make pizzas #2 and #3. Slice and serve. And enjoy. Immensely.